Calling all disruptors and innovators! 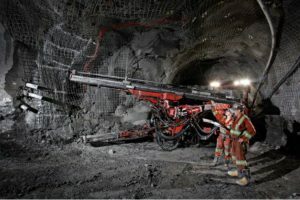 One of Canada’s largest gold producers wants to hear from anyone with an idea or a technology that will help to tackle some of the mining industry’s biggest challenges. They include everything from reducing the sector’s environmental footprint, to finding more efficient ways to locate the next big mineral discovery. The winner could scoop a $1 million investment from Vancouver-based Goldcorp. [G-TSX; GG-NYSE], the main sponsor of #DisruptMining, a web-based channel that was established to allow innovators to present their ideas to the mining industry. “Mining is an industry that has not been set up for innovation in the past and we are trying to change that,” said Luis Canepari, Vice-President, Technology with Goldcorp. He said this is because of fluctuating commodity prices and the fact that the mine permitting process tends to create a design that mining companies must stick to. Innovators and entrepreneurs are encouraged to submit their ideas for a chance to pitch in front of a live audience of over 500 industry leaders and a “shark-tank” style panel of cross country titans. Goldcorp and presenting sponsor KPMG will co-host the 2019 #DisruptMining innovation expo event, which is being held at the Rebel Entertainment Complex in Toronto during the week of the Prospectors and Developers Association of Canada conference on March 3, 2019. The winner will have the opportunity to negotiate up to a $1 million investment for a proof of concept at one of Goldcorp’s mines or a direct investment in the winning technologies. This year’s winner, Acoustic Zoom secured a $1 million investment in its business from Goldcorp and launched a pilot program at Goldcorp’s Red Lake Gold Mines in Ontario. Acoustic Zoom is an advanced geophysics company. It has developed smart drilling technology with acoustic imaging to help exploration companies gain a better understanding of the orebody. Previous winners include Enviroleach, LLamaZoo and KORE Geosystems. More than 100 submissions were received ahead of the 2018 PDAC conference, and Canepari said he believes it will be no different this year. Full application details and requirements can be found at: www.disruptmining.com. Submissions will be accepted until November 5, 2018 at 11:59 pm EST. Late submissions will not be accepted. Net proceeds from the #DisruptMining finale event will support innovation-focused scholarships and community building initiatives. As the program enters its third year, the mining industry has set its sights on a more innovative future. “I believe that within 10 years, a lot of our mines will be automated,” said Canepari.